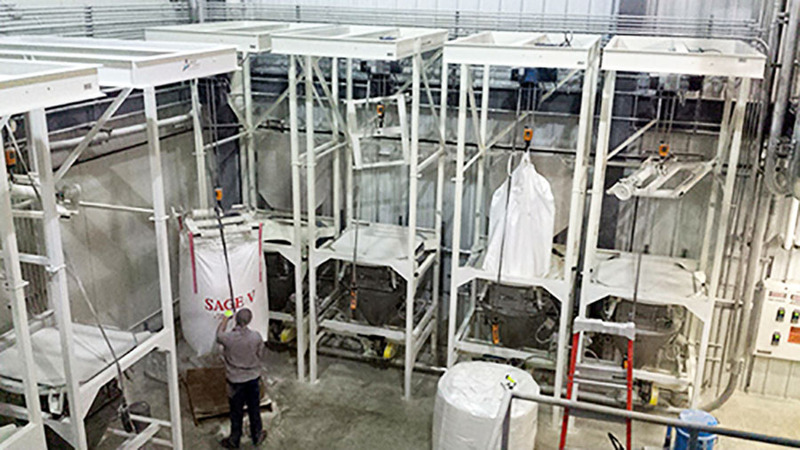 All too often customers ask “what options do I have for conveying material I get in bulk bags and integrating it into a pneumatic system?” The first question you should ask is what do you already have in place; i.e. is there an existing pressure or vacuum system or is this a stand-alone system and if so what parameters do we have to work with. Each one of these systems has various ways material can be conveyed. A dense phase system possesses the biggest challenge to unloading a bulk bag. In a dense phase pressure pot system, your biggest challenge is simply overall height of the equipment. Even for most small-scale systems (100 lb/min) by the time you add the vessel with one or two valves above it, the access hatch for the bulk bag is 10 plus feet in the air. As shown in Figure 1. this small dense phase pressure system requires a platform to reach the bag tie-off spout at 12 feet above grade. 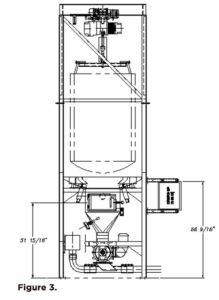 In a dilute pressure conveying system, you really only have one option: a double rotary feeder stack-up, see Figure 2.This method involves using two rotary valve feeders stacked between a small hopper with a small bin vent filter or a dust collection line. With a single rotary valve feeder, the air would leak into the bag pushing dust and material through the bag into the process area. Then as the bag empties, the air (and material) will easily start to escape between the bag and the bulk bag system. With a dual rotary feeder arrangement, the air is forced to go through the bin vent or dust collection system and not into the bulk bag. Accessing the untie box for operators in most double rotary feeder systems will range between 4-8 feet depending on system capacity. Either choice will end up with elevated heights. The main concern is how much space you need under the bulk bag station, how will employees be able to access the bag tie off area and loading the bulk bag effectively. A vacuum system is usually the simplest and most common solution to use when unloading material from a bulk bag system. These are typically used in batching and mixing applications with shorter convey distances. 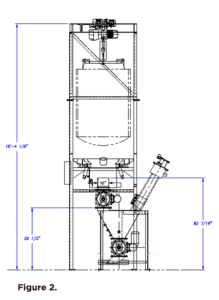 The first option would be to put a single rotary airlock at the bottom of the bulk bag unloader and feed the material into the convey line as shown in Figure 3. This method works well for virtually all materials that come in a bulk bag, the only requirement is that the material would be able to go through a rotary feeder. This also allows for a repeatable accurate introduction of material into the convey line which makes it ideal for loss-in-weight or gain-in-weight systems. The second option is to use a simple vacuum discharge adapter on the bottom of the bulk bag tie off area or below the butterfly/slide gate valve on the bulk bag system. With this type of design, inlet air is let in through a control valve. The control valve could be a simple butterfly valve or aluminum damper. This design works very well for free flowing/ non-dusty materials. The benefits of a vacuum system in this circumstance are a much lower access point that plant operators have to work with. Generally, platforms are not required and an average height person can easily access the bottom of the bulk bag to untie it. 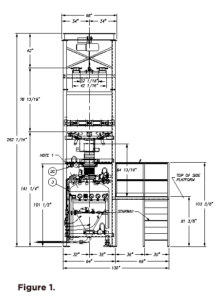 The last option for bulk bag unloading in a pneumatic conveying system is a push/pull transfer system. Typically this type of conveying system is used in railcar unloading applications but if necessary the same concept can be applied to bulk bag unloading. In a push/pull transfer system, material is vacuumed from the bulk bag unloader to a filter receiver installed in close proximity and then fed into a pressure convey system. You get the benefits of both pressure and vacuum conveying all in one solution. Also a push/pull transfer system provides increased convey distances. Though a viable option, it is not as common due to majority of bulk bag unloading systems being used in applications with shorter convey distance requirements. There are several options to choose from when you want to pneumatically convey product from a bulk bag unloader. Ranging from dense phase pneumatic conveying, pressure and vacuum transfer systems or a push/pull convey system integrating a filter receiver. It is important to work with a manufacture that has experience in handling various products to engineer, design and manufacture the proper system for your facility, budget and process.